Bill Bryson has built a career around humorous observations of tourist destinations. Inevitably he was drawn to Australia, ambitiously attempting to summarise a nation in 19 pithy chapters. It is curious, then, that he can spend most of Chapter 12 of “Down Under” heckling a small town on the mid north coast of New South Wales, called Macksville. A memorable passage. It has been used to teach English to the French (Baccalaureat), and as an example of “Powerful & Balanced Writing”. It’s even popped up in the New York Times. Now is probably the right time to mention that approximately 29 years ago, I was born in Macksville Hospital. I lived in West st, Macksville until I was 16. I have since lived in Sydney, Cambridge (UK), Zurich and now Sydney again. I have holidayed in the Macksville region every summer since moving away. I must admit that laughter was my first reaction to Macksville’s treatment at Bryson’s hand. There is a lot that hits close to home. However, there are a few facts to be corrected. Either Bryson has embellished for comic effect, or else his powers of observation are somewhat weaker than one would expect for a travel writer. Crap. After visiting Macksville, Bryson shows that he has the navigatory nous to find an obscure historical site (pre-satnav era, of course). He has been in Australia for eleven chapters. Having arrived in Macksville, he opens his book of maps. His arrival in Macksville is either moronic or contrived. Need more photos? Macksville is on a coastal plain. There isn’t a mountain within a hundred miles. The river is never swift, and except for a day or two after very heavy rain it isn’t muddy either (Bryson refers to the “dusty margin” of town, so it is unlikely that rain preceded his visit). Actually, Bryson’s only experience of Macksville is a stretch of road about 100 metres long in the middle of town. Here is a brief tour of the wider area. Many thanks to the websites / facebook friends from whom I “borrowed” these photos. 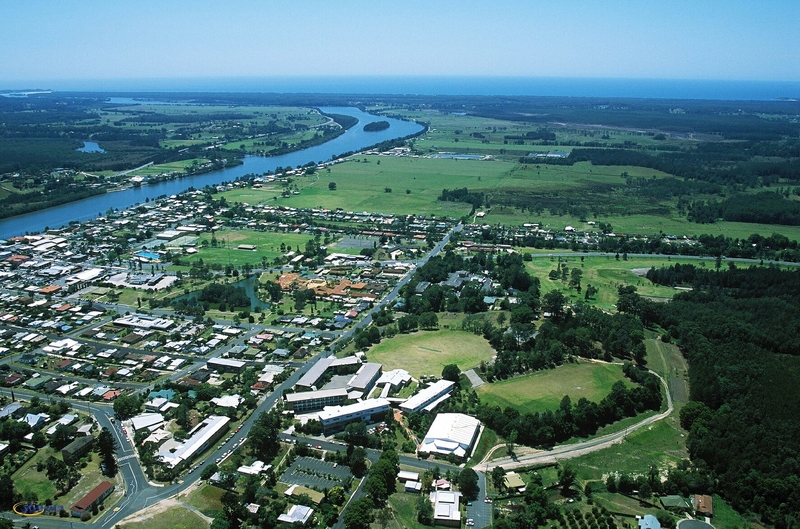 An Aerial shot of Macksville, looking East. 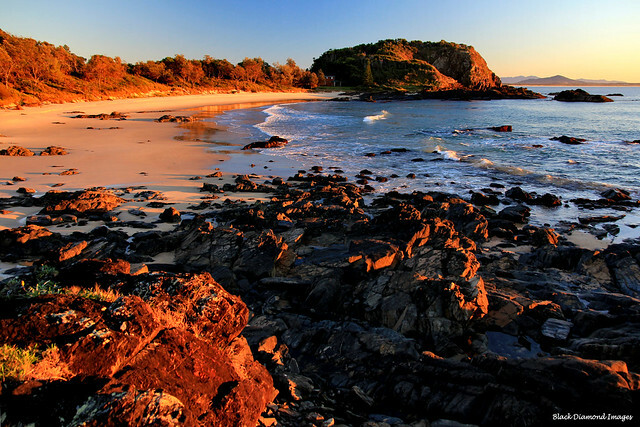 Further afield, you’ll find the Promised Land, Coffs Harbour and Dorrigo’s World Heritage rainforest. There are 80 national parks on the north coast. And a marine park. Bryson wonders at the “miraculous notion” that some people can call this region home. I had a few photos like the ones above on my computer desktop in Cambridge and Zurich. Colleagues wondered aloud why I ever left. The Chinese restaurant was just across the road as promised, but according to a sign in the window it was not licensed to serve alcohol and I couldn’t face small town Chinese food without the solace of beer. I have travelled enough to know that a chef does not, as a rule, settle in a place like Macksville because he has a lifelong yearning to share the subtleties of 3,500 years of Szechuan cuisine with sheep farmers. Another baffling observation appears in this passage. There are no sheep. The Mid North Coast is a cattle farming region. I’ve driven from between Macksville and Sydney at least 100 times in my life and I’ve never seen a sheep farm. Maybe a couple of lambs. But cows – everywhere. Cows outnumber sheep by 100 to 1 on the Mid North Coast. Exchanging “sheep” with “cattle” in the passage above doesn’t change it’s impact, of course. But I do start to wonder just how often Bryson glanced out the window on his drive north. So I went off to see what else there might be in Macksville’s compact heart. The answer was very little. … Bub’s [Hotbake] had a substantial range of food, nearly all of it involving brown meat and gravy lurking inside pastry. I ordered a large sausage roll and chips. `We don’t do chips,’ said the amply proportioned serving maiden. `Then how did you get like that?’ I wanted to say, but of course I suppressed this unworthy thought and revised my order to a large sausage roll and something called a `continental cheesecake square’ and went with them outside. I ate standing on the comer. Bryson’s indignation aside, this passage tells the story of a man asking for fried chips in a bakery. Bub’s Hotbake – the clue is very much in the name. Macksville is admittedly light on restaurants, mostly because the larger town of Nambucca is 10 minutes drive away. Matilda’s, for example, comes recommended by Lonely Planet and serves the Barramundi on which Bryson had set his heart. Seafood isn’t hard to come by when the Pacific Ocean is just around the corner. Also, the views of the Nambucca River near Macksville in the pictures above are about 50 metres from Bub’s Hotbake, easily viewable from the picnic tables. Why he stood on the corner – I have no idea. Bryson hits rather closer to the mark when he notes the struggle that the news has in making world events seem relevant to Australia. The world feels a long way away. It is a long way away. The local newspaper didn’t have the broadest view of world events. The second page of the Nambucca Guardian News once reported that the Macksville Golf Club’s greenskeeper’s dog had recently been feeling ill. A picture of the dog was included. The dog made a full recovery. And yet, this isolation is not self absorption. There is something about the region that I notice whenever I return. A thought pops into my head as I float in these waters, surrounded by sunshine and sand. I get the feeling that I should do a lot more of this. I couldn’t answer the charge of laziness, but I know what procrastination is (I write a blog!) and this is not it. I am not wasting my time. My friends and classmates have taken different paths – lawyers, teachers, bankers, graphic designers, builders, parents, the very occasional astrophysicist. Those who have stayed in the area have a different approach to life. Work a small thing. Life is elsewhere. They aren’t loafers, couch potatoes – they work very hard at enjoying life. Surfers and fishermen will rise before dawn and go to extraordinary lengths in pursuit of just the right conditions. “What did you do for fun, growing up in the country?” You just need to know the right places. Get on your bike, ride along the train line, climb under the bridge, across a small creek, through the barbed wire fence and across a paddock and you’ll find a location known simply as “the tree”. It was the ideal set up: a tall gum tree, leaning over deep freshwater, rungs nailed into the trunk and a rope swing on a high branch. Adrenaline on tap. 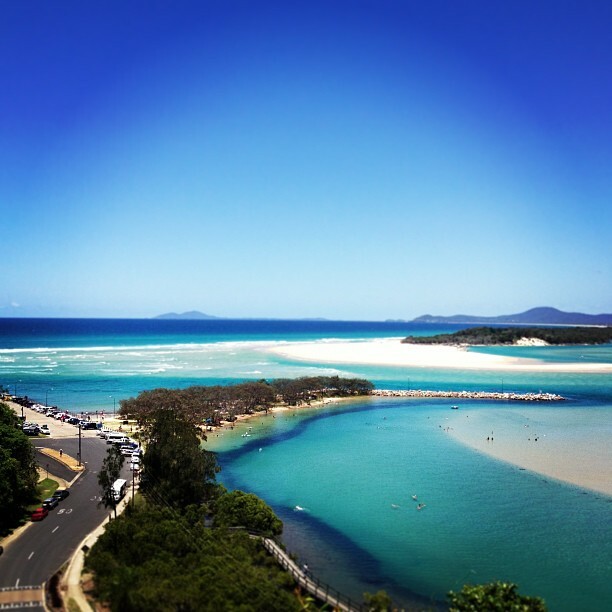 Macksville is boring – of course it is. It’s a town. It’s where you buy milk. Macksville is not why you live in Macksville. Love it Luke! I grew up in Sydney and have only been to Macksville a couple of times, but your eulogy is very evocative. I have been to many other Aussie towns, especially coastal towns, and I think it is fairly typical. If you can’t enjoy being there, then maybe get back to a bustling city and let others enjoy it. I think I would have loved growing up in a coastal town. I think your problem is assuming that Bill Bryson is a travel writer – he isn’t – he’s a humorist who use travel as his hook (I’ve read all of his books, starting with “The Lost Continent” and “Notes from a Small Island”) – I quickly learnt that he actuates the points to make everywhere he goes “funny”. It’s not a travel guide. I’m not expecting anything to be “realistically” portrayed. Nice article Luke. I admit to having never even noticed Macksville on my trips up the Pacific Highway, but having looked it up on Google Maps, that’s not so surprising. Considering the size of the place, it sounds like it’s positively buzzing. Hey Luke. I’ve found your commentaries on the Fine Tuning issues to be highly valuable. Have you by any chance composed a counter-response to Vic Stenger’s article which seeks to answer the objections you skillfully highlighted of his attempt to refute Fine Tuning arguments? Thank you for this. My apologies for being inept to find this post myself on your blog. Have you by any chance read either New Proofs for the Existence of God by Robert Spitzer or The Last Superstition by Edward Feser? Thanks for the links Luke. Reading your blog, I think you would find those books really insightful. Both concern natural theology and how reason (Feser) and science (Spitzer) can provide support for premises in metaphysical arguments for the existence of God. Thanks for the links to the posts. They were excellent. I hope you can find the time to keep up your great work in the area of Fine Tuning. I could not find any other cosmologist who analyses the ‘latest’ and ‘updated’ criticisms of Fine Turning and defends it against its ‘new’ detractors like Stenger in a similarly meticulous manner as you have done. I finished Feser’s book a few weeks ago, as well as his book on Aquinas. I’m might post a review if I get around to it. Spitzer’s book is on my todo list. Thanks for the publicity, it all helps sales ! I moved to Macksville from Brissie 3 months ago and wish I had done it many years earlier. What an awesome, friendly place. So close to beaches, rivers, shops, the highway, and everything that makes life worthwhile. God Bless Macksville and all who live here. I am a high school teacher in Macksville. Not Macksville, NSW but Macksville, Kansas, in the USA. I have been fascinated w/ Australia’s Macksville since my students discovered it one day on Google Earth. From time to time we, as a class, would check in on our twin town taking a google earth tour. We live in a dry, flat, dusty part of the US and the idea of a Macksville with an ocean appealed to the kids. Thanks, Shannon. I’ve now had a good Google Earth look around Macksville, Kansas. If your kids have any questions about the Macksville down under, let me know.